Specific antibodies are essential for reliable neural cell studies, especially for cell types with high diversity, such as astrocytes. GFAP, the most commonly used astrocyte marker, is a reliable marker for reactive astrocytes. However, non-reactive astrocytes located in healthy CNS tissue or remote from CNS lesions are difficult to be detected by GFAP immunohistochemical staining1. Unlike GFAP, GLAST (EAAT1, Slc1a3) is found on virtually all astrocytes, including reactive and non-reactive astrocytes, throughout the brain, e.g., in the cerebellum, cortex, and hippocampus. After successful generation of the first monoclonal anti-GLAST antibody2 by Miltenyi Biotec, a second astrocyte-specific antibody was also developed by immunizing rats with astrocytes isolated from GFAP-EGFP transgenic mice: The Anti-ACSA-2 (anti-astrocyte cell surface antigen-2) antibody. Immunocytochemical, immunohistochemical, and flow cytometric analyses show that the ACSA-2 antigen is specifically expressed on GLAST-positive astrocytes and that the Anti-ACSA-2 antibody is highly specific for all astrocyte lineage cells, both neonatal and adult3 (fig. 1). Recently the ubiquitously expressed astrocyte protein ATP1B2 was identified as ACSA-2 epitope and the Anti-ACSA-2 antibody was recommended as the “first-choice method for astrocyte isolation and characterization”4. 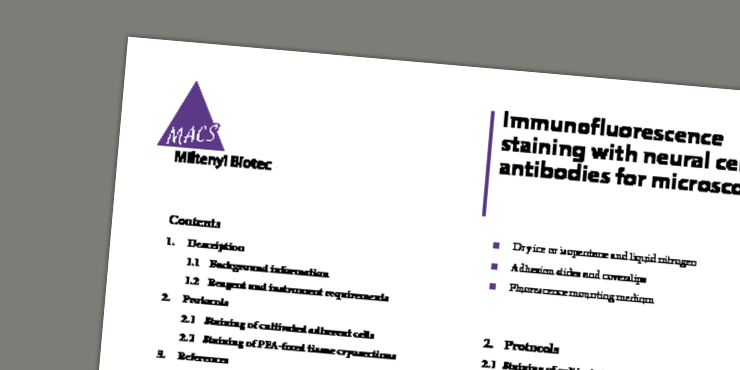 Immunocytochemical and immunohistochemical analysis of ACSA-2 and GLAST co-expression. Figure 1 Immunocytochemical and immunohistochemical analysis of ACSA-2 and GLAST co-expression. (A) Neonatal mouse brain was dissociated using the Neural Tissue Dissociation Kit (P). Cells were cultured in MACS® NeuroMedium, MACS NeuroBrew®-21, 1% P/S, and 0.5 mM L-glutamine on PLL-coated 24 glass wells. After 7 days, in vitro cells were fixed and stained with Anti-GLAST pure (red), Anti-ACSA-2 pure (green), and DAPI (blue); and analyzed by confocal microscopy. Co-expression of ACSA-2 and GLAST is found in primary astrocyte culture. (B) Adult mouse cerebellum cryosections (10-40 µm) were fixed and stained with Anti-GLAST pure (red), Anti-ACSA-2 pure (green), and DAPI (blue); and analyzed by confocal microscopy. 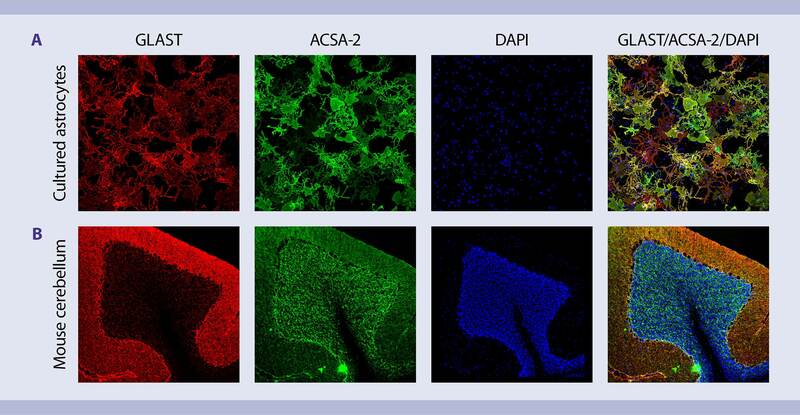 ACSA-2 is co-expressed with GLAST in the cerebellum, but showed a brighter expression in the granule cell layer. Simply fill out the form below to get in contact with us.